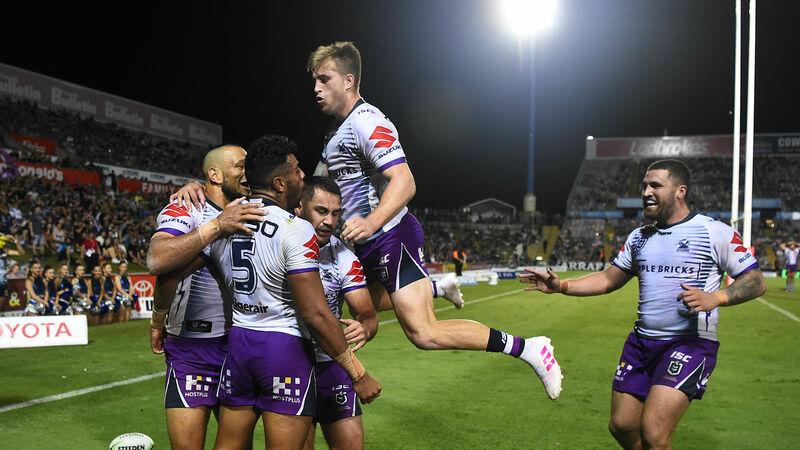 Round six of the 2019 NRL season sees league leaders Melbourne Storm host defending champions Sydney Roosters in a mouth-watering top-of-the-table clash. The Storm are the only unbeaten side remaining after five matches and history suggests they could well extend that run on Friday given they have won their last three against the Roosters. It has been a tough start for the Canterbury Bulldogs and they face another difficult clash as they host South Sydney Rabbitohs at ANZ Stadium. Meanwhile, the Parramatta Eels will host the first NRL game at their new stadium, Wests Tigers the visitors to Bankwest Stadium on Monday. We take a look at the next round of fixtures with the help of Opta data. - The Sharks have won their last six games on the bounce against the Panthers; only once in premiership history has either side won more successive iterations of this fixture (Penrith won the first seven from 1967 to 1969). - Penrith's Isaah Yeo has crossed for a try in four of his last six NRL games against the Sharks. - Reimis Smith has crossed for a try in each of his last four NRL games; the last time any Bulldogs player scored in more consecutive fixtures was Will Hopoate, who did so in his first five games in 2016. - The Bulldogs (8) are the only team to have made fewer errors per game in NRL 2019 than the Rabbitohs (10). - The Roosters have led at half-time in each of their last eight games, keeping their opposition scoreless in the first half of four of their last six games in the competition. - James Tedesco has scored four tries in his last three games, crossing at least once in each of them; however, he's scored only one try in his last five games against the Storm. - Each of the Warriors' last 10 games has been won by the home team on the day; the Warriors have won their last five games on the bounce as hosts. - The Cowboys have failed to post 20+ points in any of their last four games; the last time they went longer without doing so was a five-game span from Round 9 to Round 14 in 2008. - Cameron McInnes has made the second-most tackles (240) of any player this season, missing just six further attempts for a tackle success rate of 98 per cent. - The Sea Eagles have scored 11 tries through the middle third of the field this NRL campaign, more than any other team in the competition. - David Klemmer (Newcastle Knights) has made 20 carries per game in 2019, one of only two players (Jayden Okunbor - 20.3) to have made an average of 20+ per game. - Three of the last four games between the Titans and the Knights have been won by the team trailing at half-time on the day, with each side snatching two wins in that span. - Brisbane have won their last six games on the bounce against the Raiders, including their last two after having trailed at half-time. - The Raiders have scored six tries from kicks this season, more than any other team in the competition; however, the Broncos have conceded just one try via this method. - Clinton Gutherson (Parramatta Eels) has gained 865 metres over the advantage line this campaign, more than any other player in the competition and 225m more than the Tigers' best Mahe Fonua (640m). - The Eels (20) and Tigers (22) have conceded fewer penalties than any other teams thus far in 2019.